The MEGA Magnus will be available in the UK (and I guess other territories) from 1st January 2014. Fortunately it will not be an exclusive which means that it will be available from most retailers. At £14.99, it will also be considerably cheaper than I was expecting and I'm sure we can expect this price to come down as we see retailers competing. If the pricing stays true to form, we can expect that the Magnus will be on sale for $14.99 in the US as well, although, I cannot say if this release date applies to the US too. Below is the blurb sent to me by Hasbro. By now you are all used to this format but I thought I'd post it anyway. The N-STRIKE MEGA MAGNUS blaster boasts mighty power and MEGA distance, now in the palm of your hands! Made to go mobile, this one-handed N-STRIKE MEGA blaster features an integrated internal clip so you can reload fast and send the MEGA whistler darts screaming through the air. 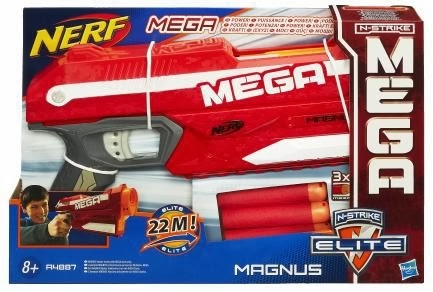 The MEGA MAGNUS Blaster fires MEGA darts up to 85 feet! Comes with three MEGA Whistler darts. Available at most major retailers nationwide. Visit www.nerfelite.co.uk for more info. Hasbro clearly state above that the MEGA Magnus will hit 85 feet (25m) which means that we will not be receiving a wimpy version of the Magnus like we did with the Centurion. I really like the NERF MEGA Magnus. It is a great blaster and I am happy to hear that we will be getting it over here. I don't regret importing mine from Singapore at all. Put a Stampede spring in there and it's awesome. Don't get me wrong. I don't regret buying one from SG, It's a really fun blaster. I just wish I had waited a bit. Then I could have bought three! Sorry to hear that fella. Maybe now would be a good time to start modding?